'Vivas in deo' or simply 'Vivas' ('Live in God' or 'May you live in God') was a common inscription on Roman objects. The inscription 'Vivas', sometimes added to a first name, was used on pagan objects but was also associated with other Christian symbols such as the chi-rho monogram (the first letters of Christ in Greek), palm branches or the Lamb of God and may therefore be a Christian inscription. If so, the use of a overtly Christian phrase on a finger ring suggests that the wearer wanted their religious beliefs to be clearly identifiable and that Christianity, though still a minority religion, was now acceptable. The same inscription is found on the 'Vyne ring', a Roman ring belonging to Silvianus which is believed to have inspired the author J.R.R. Tolkien to write 'The Lord of the Rings', on a ring found in a Roman tomb in the Catacombs, Rome and on spoons in the Hoxne hoard and the Mildenhall Treasure (both in the British Museum). Bronze signet ring, the rectangular bezel inscribed VIVAS IN DIO. Ex Waterton Collection. The bezel of a silver ring was recorded by the Portable Antiquities Scheme in 2013, found in Swaffham, Norfolk. It features a profile male head with the retrograde inscription 'Antoni Vivas in Deo' and was probably used as a personal signet. A ring found in 1823 in Brancaster, Norfolk is engraved with two profile heads facing and 'Vivas in deo'. 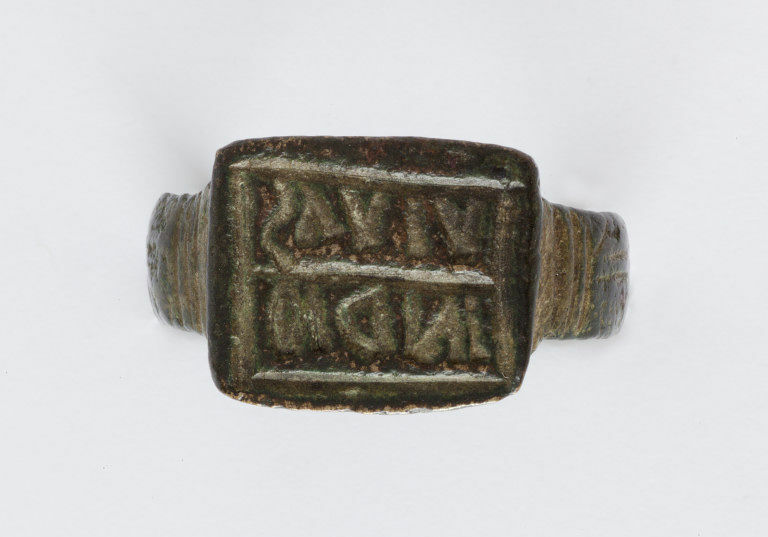 Drury Fortnum describes a bronze ring with a square bezel inscribed 'Vivas in deo' in the Vatican collection, which had been found in the Catacombs, in Rome. There is a group of rings in the British Museum including a very similar bronze ring with a rectangular bezel inscribed VIVAS IN DIO on two lines, reversed (Dalton, O.M., Catalogue of the Finger Rings, Early Christian, Byzantine, Teutonic, Medieval and Later in the British Museum, London, 1912, p. 3, cat. 8) and others with variations on 'VIVAS' or 'VIBAS'. The Christian association is strengthened by a bronze ring with a Chi-Rho and the inscription 'ARBORI VIBAS IN CRISTO'. 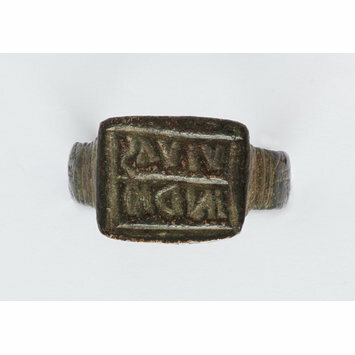 Edmund Waterton discussed these rings in his 'Dactyliotheca Watertoniana', p 88: "Other Christian rings have acclamations or good wishes upon them, similar to those which are found on Roman Pagan rings, such as VIVAS IN DEO and the like. A ring in the Kircherian Museum has SPES IN DEO and Ficorini gives another with DEUSDEDIT VIVAS IN DEO." There are two other Waterton rings with 'VIVAS' inscriptions: museum numbers 580-1871 and 581-1871 although neither of these is overtly Christian. These rings are discussed in 'Late Antique and early Christian gems' (Jeffrey Spiers, Weisbaden, 2007, pp. 135-9). Dalton, O.M., Catalogue of the Finger Rings, Early Christian, Byzantine, Teutonic, Medieval and Later in the British Museum, London, 1912, pp. XXVII and 3-4.